Birds are Flying--Well not Everyone! March 03, 2002 - Onyx the Sandhill Crane, Payton the Red-tailed Hawk and Devon the Bald Eagle are off! It is still early in the season, but it has been a very warm winter in many parts. Will the warm weather hold out and will the land, food and weather meet the needs of the birds? 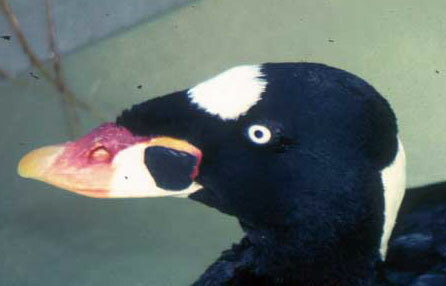 The Surf Scoter, our newest species is still awaiting its first successful outfit of satellite transmitters. The U.S. Geological Survey has attempted for several weeks, and reported to us this week: "Yesterday we spent the afternoon and evening out on the bay, attempting to set up floating mist nets to [attract] birds, and although some birds were attracted to the decoys, we had no luck ..."